While I have done quite a bit of ultraviolet photography in the past, I haven't done any ultraviolet induced fluorescence photography. 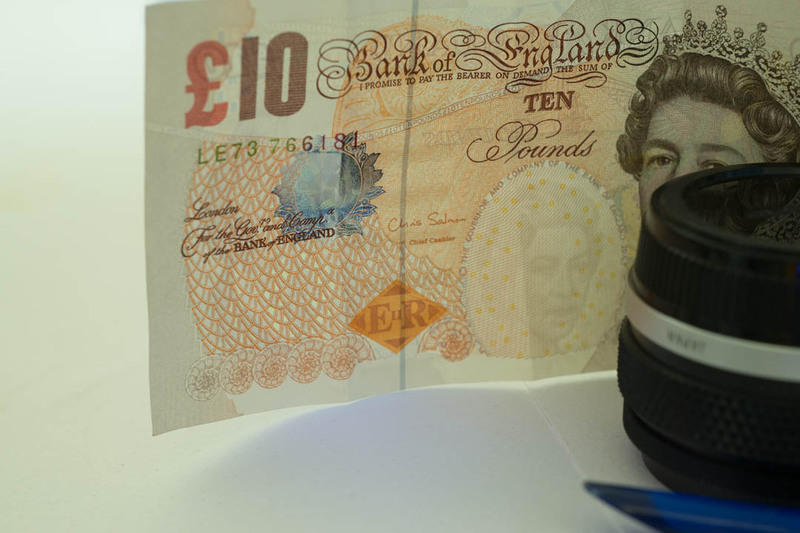 This involves lighting the subject with UV light, but recording an image that only includes visible light. The idea being to capture any visible fluorescence caused by the UV light. The difficulty in doing this is finding a light source that emits only ultraviolet light. If we have a source that emits UV and visible light, then the visible light output will likely overpower any fluorescence in our image. So that means a full spectrum flash is not suitable. One possible solution would be to use a UV-pass filter in front of a full spectrum flash. This would require making some kind of filter holder to hold the filter in front of the flash. I also didn't really want to have my expensive Baader U filter blasted at close range by hot flash. So that led me to look at UV torches. 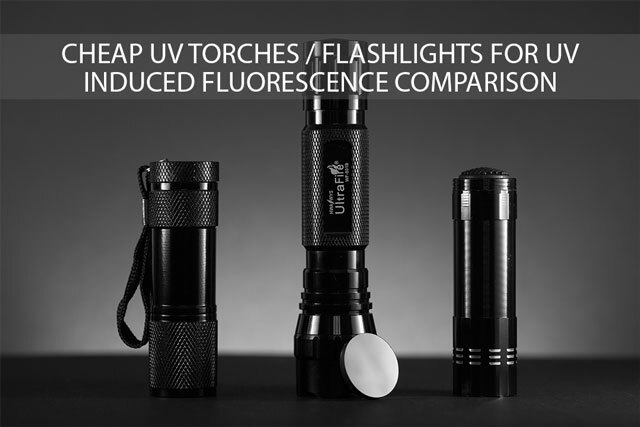 The torches most recommended for UV / UV induced fluorescence photography use UV LEDs produced by the Japanese company Nichia. However, these are very expensive. 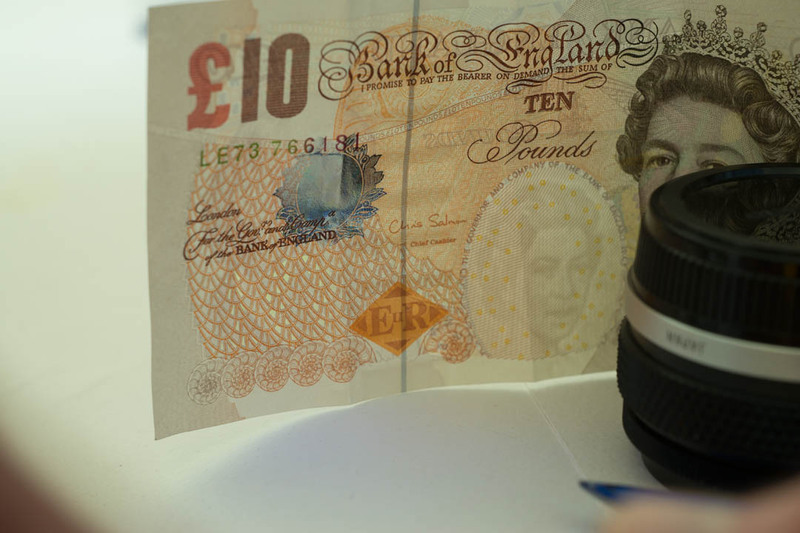 There are much cheaper alternatives available, but are they any good? The first two are both 9 LED and take 3 AA batteries. Both cost about 99p and strangely both had one LED not working (so they were actually 8 LED). The Ultrafire torch was probably a bit over £20 when you include the cost of the special batteries and charger it requires. Before I go into my test, I should mention a couple of tests others have done, which test a different selection of UV torches: Extreme Macro: Lighting For UV Macro and BudgetLightForum.com - Review: UV light shootout, seven lights tested. The first thing I noticed when I received the torches was that all three gave out a lot of visible violet light. The ultrafire torch gave quite reasonable results when shone through my Baader U filter. The other two torches gave very faint results when shone through the Baader filter, but it did make the fluorescence easier to see than with no filter. So, I purchased from ebay Optical Filter 330WB70 25mm Excite Fluorescence High Transmission 70% . This passes light from around 300 nm - 400 nm, cuts visible light, then starts transmitting some IR from around 810 nm. So by adding this to the torch, I can block any visible light it produces and turn it into a true UV torch. 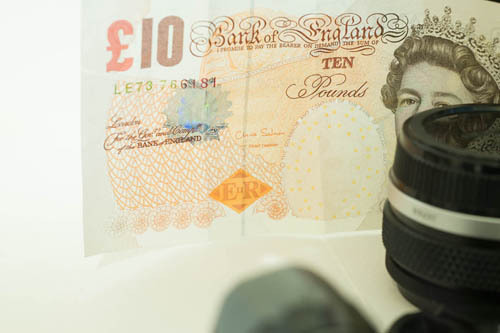 Including postage, tax, and post office fees the filter came to around £40. So it puts the price of a cheap UV torch up considerably. But it still keeps the price a lot less than the torches using Nichia UV LEDs. 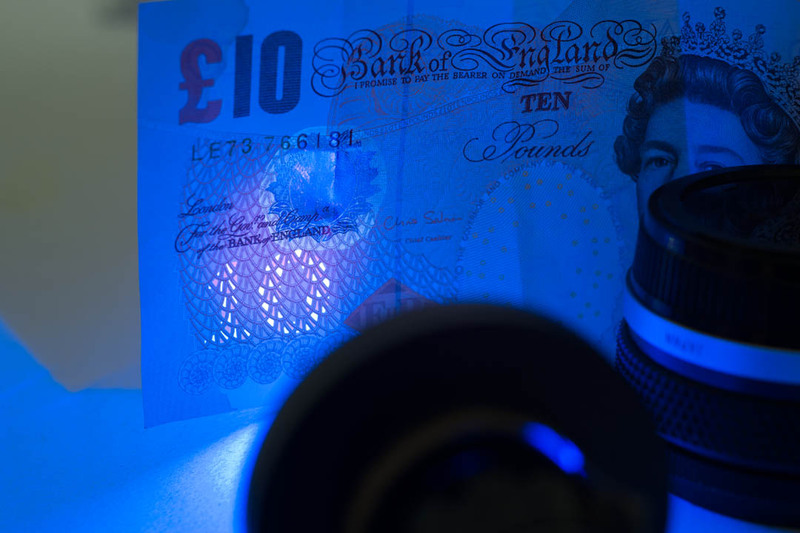 The test subject was the UV security feature on a Bank of England £10 note. This has a number 10 that cannot be seen under normal light, but fluoresces under ultraviolet light. 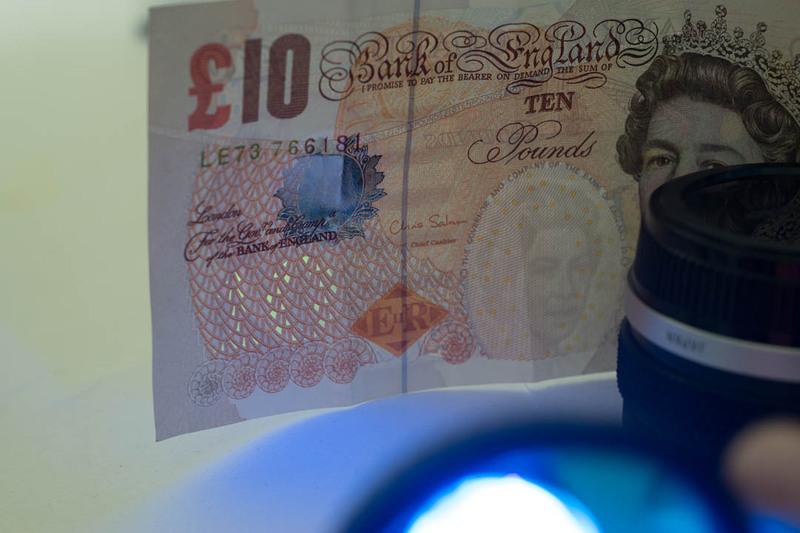 According to the Bank of England A UV lamp that emits light at around 365 nanometres is ideal for checking the fluorescent features . I kept the aperture and ISO the same for each shot, but varied the shutter speed. I'll include the shutter speed below each image. Ultrafire torch - 1/80s. 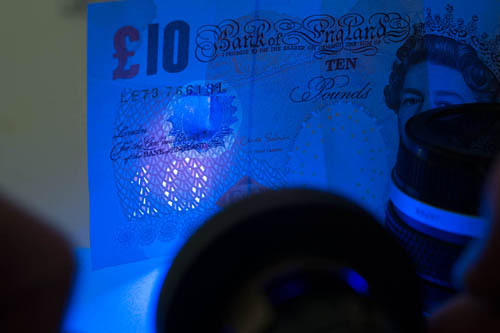 We can just see the fluorescence of the security marking, but it is swamped by violet visible light produced by the torch. Ultrafire torch w/ 330WB70 filter black side facing out - 0.4s. The 330WB70 filter has a shiny red side and a dark black side. I decided to test with the filter in both directions in case it had any effect. Ultrafire torch w/ 330WB70 filter shiny side facing out - 0.4s. As you can see, it doesn't seem to matter which way round the filter is mounted on the torch. Ultrafire torch w/ Baader U filter pink side facing out - 0.4s. I tested to see if the direction the Baader filter was used in had any effect as well. You can see the Baader filter passes quite a bit more visible violet light than the 330WB70 filter. Ultrafire torch w/ Baader U filter gold side facing out - 0.4s. As with the 330WB70 filter, it doesn't seem to make any difference which way round the filter is mounted. Cheap UV torch 1 (Waterproof Outdoor 380-400nM UV Ultra Violet LED Flashlight Light Torch Lamp) - 1/5s. Seems like a lot of violet light but not much UV. Cheap UV torch 1 w/ 330WB70 filter - 2s. Blocking the visible light from the torch shows just how little UV there is. Cheap UV torch 1 w/ Baader U filter - 1.3s. Interestingly the marking fluoresces better with the Baader filter. Cheap UV torch 2 (Aluminium UV Ultra Violet Blacklight 9 LED AAA Flashlight Torch Light Lamp) - 0.4s. Not much different from the other torch. Cheap UV torch 1 w/ 330WB70 filter - 2s. 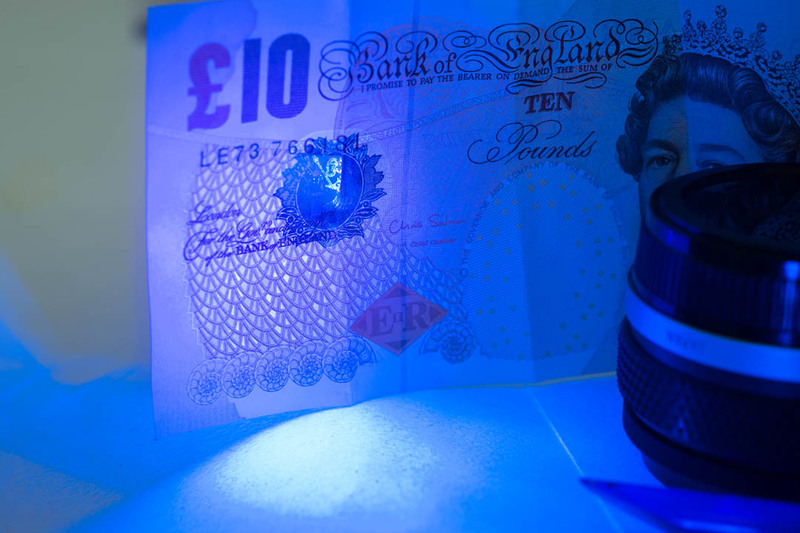 Again, pretty similar result to the other 99p UV torch. Cheap UV torch 1 w/ Baader U filter - 1.3s. Much the same again. In conclusion, I think we can say that the really cheap 'UV' torches are actually just violet torches that output a tiny amount of UV. 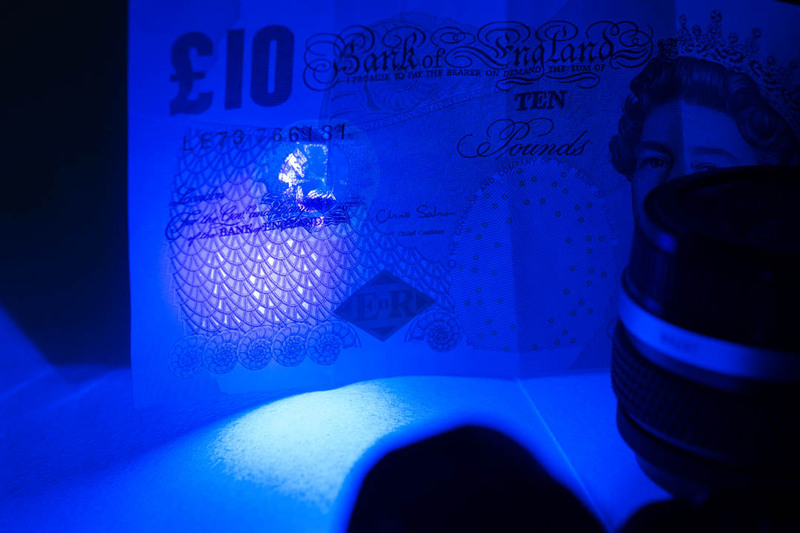 The cheap but not quite as cheap Ultrafire torch does output UV light. However, I seriously doubt that its peak output is 365 nm. It looses a large amount of light when the 330WB70 filter is added, even though this filter passes around 70% of light at 365 nm. I'd really like to try out the MTE U301 torch, which uses a Nichia UV LED, and see how that compares. However, at around £120 it's a bit much for me. Maybe if I get into UV fluorescence photography a bit more, then I'll consider it. Good article, I had very similar results when I was tottering about testing these. It’s a shame you’re not closer to Surrey, I’d be very happy to lend you my MTE U301 for a play – this was about the cleanest non-spill source I could find. 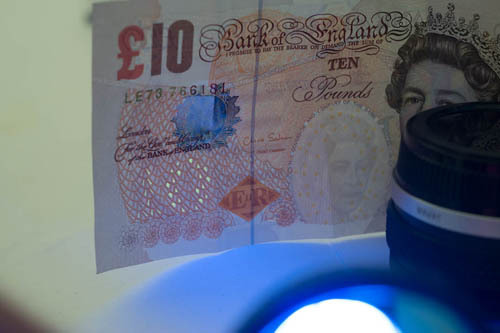 This LED technology is developing quickly though and I don’t think it’ll be too long before there are decent 365nm lightsources available with the brightness to take handheld shots UV. You can get close already with high ISO but another order of magnitude wouldn’t hurt. Thanks for the comment! 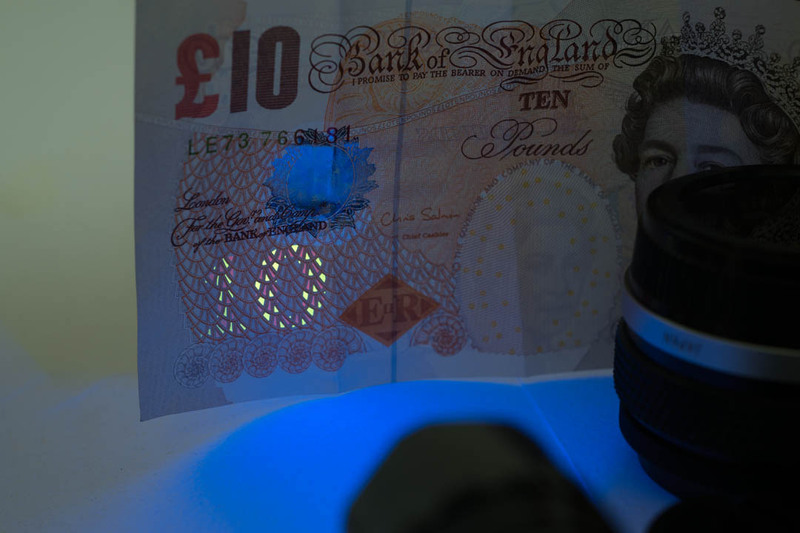 To be honest, I haven’t actually tried any UV fluorescence photography (other than this test) yet. It’s definitely on my to-do list, I’ve just been busy with other things. I hope they can develop UV LEDs that are both more powerful and affordable. The ultrafire UV torch I have is far less powerful than sunlight, and I find even bright sunlight combined with high ISO difficult for handheld reflected UV photography. The results can be quite interesting though. Dont know if you’re still interested but…. Thanks for the pointer, though I already knew about that one – I’ve actually reviewed it here: More UV flash and torch tests. Of course, that flashlight wasn’t available at the time I wrote this post. 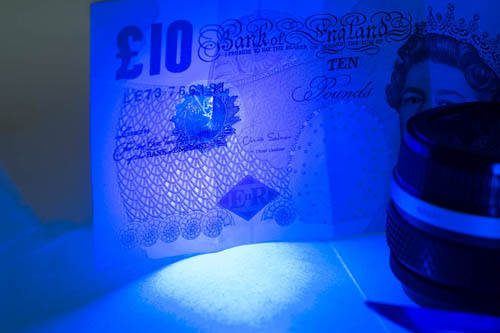 You’re right, it’s a great value UV light.